We specialize in hardscape installation from design to full retaining wall and paver brick installs. Fireplace or firepit install and outdoor living spaces are our specialty! Installation of Irrigation systems, sodding and full scale themed plantings to compliment your home are also provided.. Living in the lake vacation center of the state we have become very knowledgable in shoreline erosion control, shoreland issues and zoning regulations and would be happy to help our customers with any questions they may have regarding their lake homes. We deal mainly with residential single family properties as well as some new and redo commercial projects within the counties of Menominee, Shawano, Oconto, Brown, Forest and beyond. We keep current of all of the newest product lines available as well as keeping current with all new shoreland and zoning regulations within the Legend Lake area primarily, as well as all Menominee and Shawano, Oconto and Forest county waterways. If you're planning on Landscaping or stabilizing your shoreline or riverbank in the 2019 Landscape season call Angie to set up a consultation for a free estimate at your home. 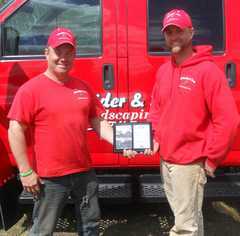 Schneider & Son's Landscaping is proud to enter our 24th year of service in the area and we are also happy to share with you some of the latest and greatest offers in the landscape materials product line for 2019. We offer full shoreline restoration using Bioengineering, Geoweb with vegetation or complete rip-rap repair or install and would be happy to share what we have learned with you. Schneider & Son's Inc are members of the Wisconsin Landscape Federation, Wolf River Builders Association, Wisconsin Builders Association, Cecil Chamber of Commerce, Shawano Chamber of Commerce and Wisconsin Independent Business Owners and have also been fully accredited in Landscape Construction, permeable hardscape installation and Erosion Control through the State of Wisconsin as well as State and County recognition for permitted waterway applications.